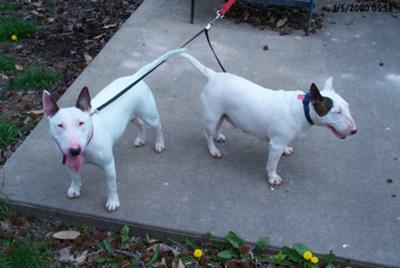 September 7th, 2005 at 1:15 a.m. one of my two adult female Bull Terrier's (Matty) woke me up from a sound sleep by scratching on me until I woke up to a fully engulfed mobile home house fire. According to the fire marshall it was an accidental electrical fire. The fire had knocked the power out. There was thick black smoke everywhere. I sought out the back door (the closest door to my bedroom). When I entered the hallway I saw that the kitchen and living room areas were fully engulfed with flames. I was breathing that thick smoke and was getting dizzy. I found the backdoor and grabbed ahold of the doorknob and it was cherry red hot and burned all the skin off of my right hand. I twisted the knob and the door would not open. I learned later from the firemen that in a fire the heat swells doors shut. So I grabbed ahold of the doorknob with my left hand and screaming because of the burns to my hands and body I stood back as far as I could and hit the door with all of my body weight (I'm 6'7" tall and weighed 325 lbs then). This is the wild part. As I mentioned earlier I was getting dizzy from breathing in all the smoke. When I hit the door with all of my weight I busted through the door and before I hit the ground I had passed out. The firemen when they arrived found me laying on the ground passed out with one foot still in the doorway. I was taken by ambulance to the hospital where an emergency tracheotomy was performed because I wasn't getting enough oxygen to my lungs. After the tracheotomy I was life-flighted by helicopter 180 miles away to the burn unit at Springfield Memorial Hospital in Springfield, Illinois. There I laid in a coma for 6 weeks of the 13 weeks I was there being treated for 14% body burns mostly to my hands, arms, scalp, and back (two skin grafts on my back) as well as my lungs being destroyed 36% from the excessive smoke inhalation. For every day a person lays in a hospital bed it takes 2 days to get your muscle strength back. It's called atrophy. So when I was discharged 13 weeks later from the hospital I had to take another 13 weeks of rehabilitation to learn how to walk, lift, and get my muscles back in shape. From all that excessive smoke inhalation the doctors at the burn unit diagnosed me with COPD, dyspnea (shortness of breath), and severe obstructive sleep apnea. I have to take breathing treatments 5 times a day as well as two different gas inhalers when needed. I cannot go to sleep unless I have the CPAP breathing machine with full face mask that forces air to my lungs. If I go to sleep without it I will quit breathing. I'm grateful that my dog Matty (Tanner's Matalya Zuell Baby) woke me up otherwise I would of died in that fire from the excessive smoke inhalation. Matty and her mother Tanna (Tanner's Tanna Spuds Nicole) both died in that fire. Evidently they never went out the door where I barely escaped from. I have no idea why except maybe they had passed out from the smoke inhalation too? I just don't know. That fire ruined my life. I lost all of my possessions, my two registered Bull Terrier dogs, a stamp collection of forty years, some old gold antique jewelry, my lungs and breathing capacities. I can never ever work again without running out of breath easily. I'm grateful to be alive. I owe my life to Matty. Had she not scratched on me to wake me up I would have died in that fire too. Dog spelled backwards is God. In my own opinion I believe God used Matty to wake me up so I could escape. Thank you Matty! So glad my friend of many years is still alive! As i got to know your awesome dogs, taking care of them for 6 months, i just fell in love with that breed!